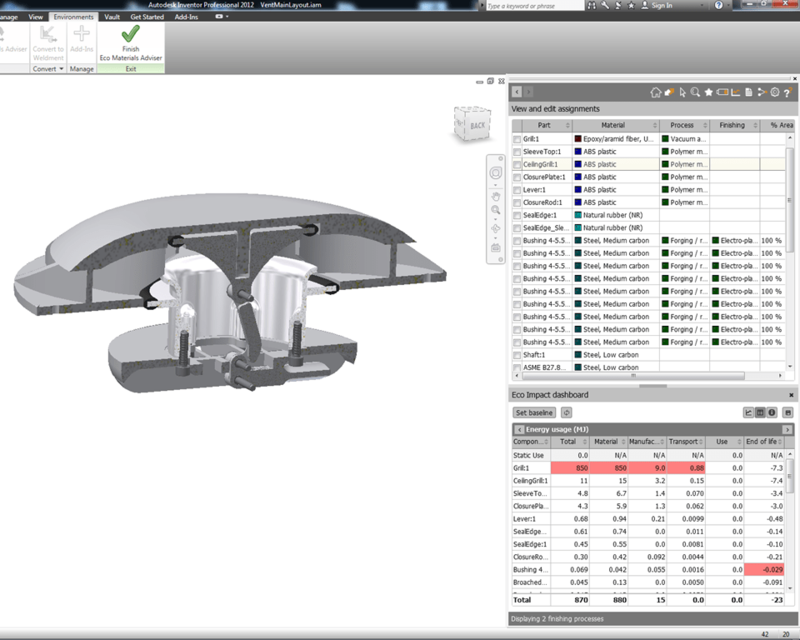 Autodesk included a nice addition to the Environments Tab of the Inventor 2012 Ribbon: The Eco Materials Adviser (EMA). This tool allows the user to access Granta’s database, and assign materials from their huge selection to the components in Assemblies and Part files. Once applied, the tool calculates the environmental impact in relation to known manufacturing requirements. More on the analysis later. The Adviser that comes with Inventor is a stripped down version, and only contains a small sub-set of the Granta database. This includes a 20 part limit on analysis. On September 29 of this year, Granta announced that an upgrade would split the tool into two versions, Base and Full, and open up access to a lot more goodies. Now permits custom Inventor material styles to be mapped to suitable equivalents in the EMA database. Now supports Information updates in the EMA database. Analysis of unlimited number of components in assemblies. Consideration of the impact of surface finishing processes. Once initiated, the standard EMA opens up as a dialog sidebar, on its home panel. At the bottom, you may have noticed an upgrade button is now active. This first update is required in order to replace the Base EMA shell, and ultimately activate the full version capabilities. When you pick the Update button, you are forwarded to the Eco Materials Adviser September 2011 Release Notes. 1. You have to uninstall the previous version. 2. You need to scroll to step #2 of the “Installation Instructions”. There it says “click here to download the update”. I emphasize this because it’s almost invisible, and the download is nowhere else on the page. Everything else that says Upgrade is a link to purchase the Full version. Here’s the link: The Granta Updated Base Version Installer for 64 bit OS or the Installer for the 32 bit OS. 4. Activate the Full version in the Settings panel of the EMA by entering your new username and password. Here’s the notes from Granta. 5. Exit the EMA and Inventor. Once restarted, the full version is activated. I had the opportunity to exchange a few emails with Sarah Krasley, the Autodesk eco-princess, whom I’ve wanted to chat with for some time. During the exchange, Sarah mentioned the recent EMA full version, and did I want to peek inside?…Duh. Granta states that the list subscription price of the Full version is 995 USD, but that they are running a special launch offer to Inventor users who upgrade now for only 795 USD. I forget the cutoff date, which I read once, but cannot seem to find it advertised anywhere. Perhaps they are testing the market price and the 795 USD will stick. What is not clear is if you opt now, will your 795 continue, or will you have to pay more next year. Just remember it is a subscription. So far the tool has offered the obvious benefit – Access to those materials. I immediately found the data I had needed for some time. Next week I’ll discuss that, as well as the analyses and comparison features. There is one shortcoming that I noticed that could easily make the tool substantially better for everyone, and I’ll detail that too.